When will the new Kia Rio be added? I've asked that before months ago and seems to have fallen on deaf ears. When an all new generation comes out it should have its own separate forum, like all the models before - why should this be any different? Come on moderators get this rectified. Don't recall it ever being asked - could you link to that request and we can take a look. New subsections are usually only created when the market dates are announced, and the new model has significant differences/changes such as engine and body, not just trim changes. Do you have a link to the spec for this model, and the differences to the previous one? A Google search for the Rio 4G comes up with nothing - bear in mind the MOD's don't know every Kia model, so if you come across something like this, provide the info and it will be reviewed and implemented, and if not you'll be informed why. IRVINE, Calif., August 28, 2017 —The all-new 2018 Rio sedan and 5-door hatchback are the latest additions to the world-class Kia Motors America (KMA) model lineup. *Delivering a new eye-catching design that is decidedly European, this subcompact duo will bring an exciting combination of fuel efficiency, innovative technology, advanced safety technology4,*everyday convenience and fun-to-drive character to value-conscious consumers when the cars arrive at Kia retailers in the fourth quarter of this year. It's been on sale in Canada for a couple of months now (and in Europe) and for Canada and the US it is built at the all new Kia plant in Mexico along side the Forte. Last edited by conwelpic; 10-02-2017 at 10:50 PM. To get the admin attention quicker with suggestions like this (or any site suggestions for that matter), it is recommended that you post in the Kia-Forums.com Site Issues and Website Help - Kia Forum section where we check in here within 24-48 hours (mods may be able to address sooner). As ron1004 said, if the new model has been announced and there are significant differences/changes (engine/body) and not just trim changes, then we can consider creating a new section for this. I see one of your thread links you posted another link within that states "The 2017 Kia Rio is set to go on sale in the first quarter of 2017.."
We'll have a discussion amongst the staff here and look into this. ron1004 and conwelpic like this. 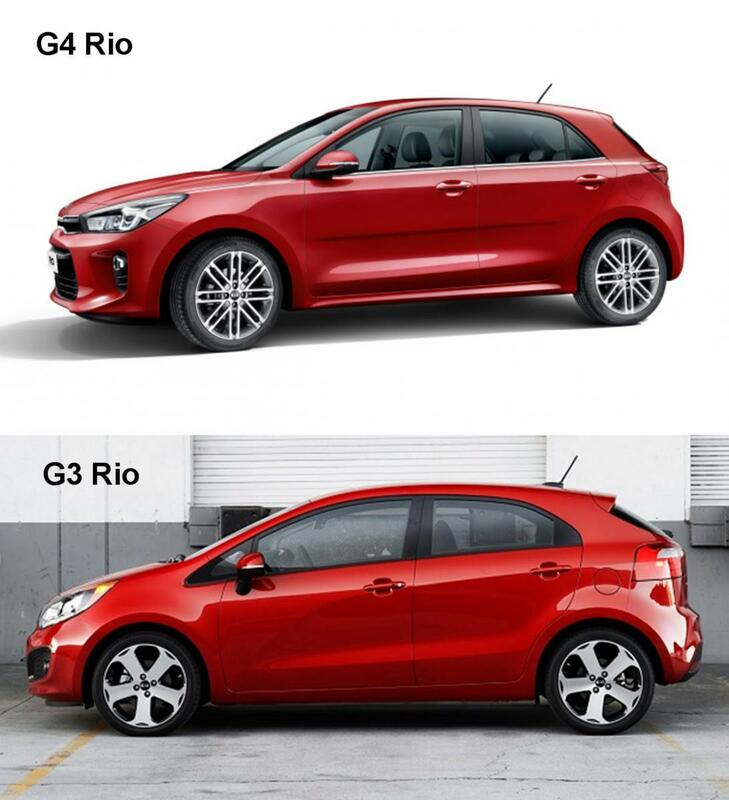 how long is this going to take, this all new Rio is already on the market in the US and has been in Canada for many months. Are you still not convinced it's all new? Admin did review this and could not find evidence that the changes were anything more than cosmetic. Each year the models are labelled "All New", but they don't always have significant differences, other than cosmetic, to the previous year - is there a link available that clearly lists the difference, and I'm sure Admin will take another look at it. seriously, I can't believe that So you don't believe KIA when they say its all new, and visually you can even see a dramatic difference to the G3 model. See my previous posts to the links (post #4 ). They only change the generation number when its all new and this is the G4. Why is it on your forum sub-headings that you accept the other generation changes but not this one. Most generation last about 5 years and then they introduce a all new version. You show G3 going from 2012-2017, now we are on G4 from 2018. Read the reviews and watch the video's - it's brand new from the ground up. Here's their media page with all the details on this vehicle. You will also note that under "What's new" heading there is nothing because it's all new. If you use the drop-down link for the 2017 model for example, you will see they list what has changed between for that model year. Kia does not say all new if it isn't, they just point out the differences. "Completely re-designed for 2018 Model Year"
They did not tool up for an old model in the brand new Mexican plant and that's where in comes from to supply Canada and the US and Central America. This is a world model and every single review says its all new. You will see it clearly states the G4 generation, but then again maybe Admin thinks its all bogus. If you don't believe anything that I'm saying or that any of the links I provide to prove it's all new I don't know how to convince you further. If you want to bury you head in the sand and believe that the 2018 model is still a G3 model, when everyone else says its a G4 then so be it. Thanks for the feedback. I've brought this up in the mods discussion section. Really no need to get obnoxious. Seeing as you seem to know these models better than Admin and the MOD's, why not take the time to educate us with a simple list of the technical and cosmetic changes?